Each paleo chocolate chip cookie recipe is represented above in succession beginning with Recipe 1 and ending with Recipe 6. After undertaking (and succeeding at) the challenge of designing a delicious "paleo brownie" recipe for a friend, I decided it was time to tackle paleo chocolate chip cookies. What follows? 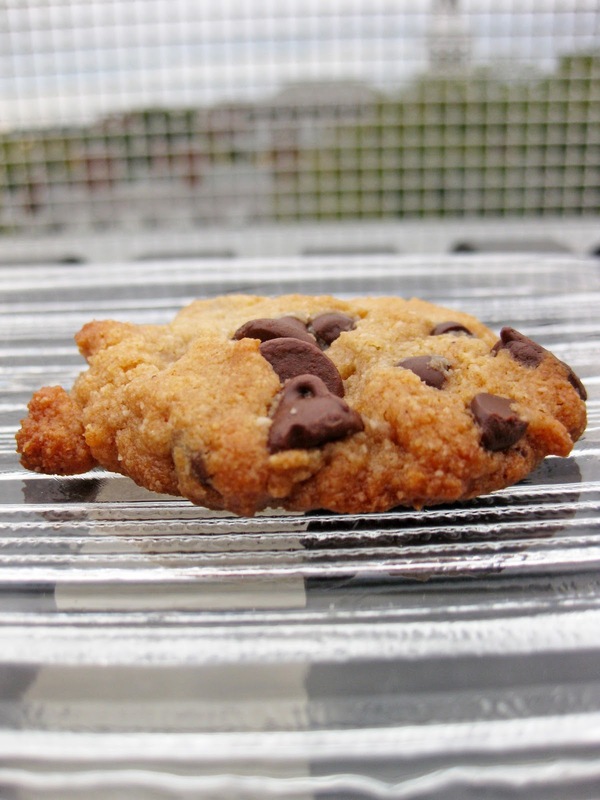 The baking and ruthless taste testing of 6 paleo chocolate chip cookie recipes. 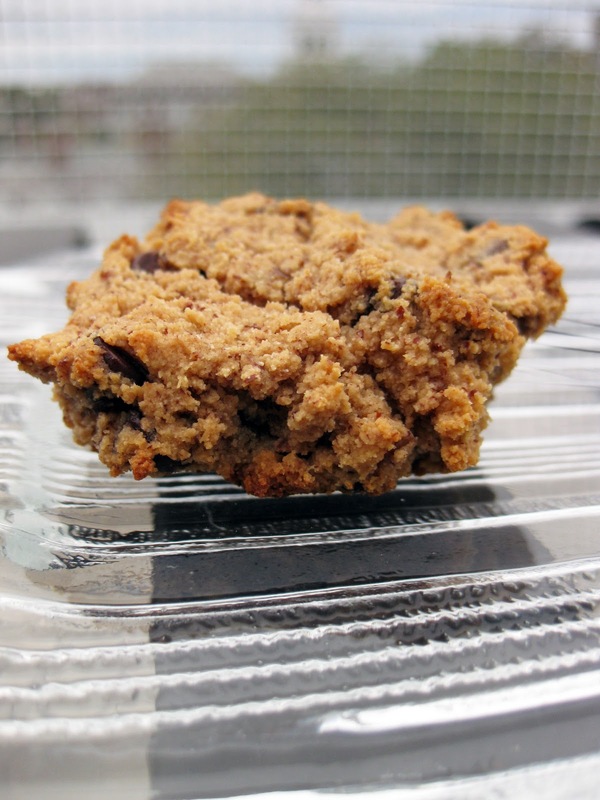 My ultimate goal is to deliver a cookie that looks and tastes as close as possible to a traditional chocolate chip cookie but does not step far outside the bounds of the paleo way of eating. That means excluding most refined oils (other than nut oils, olive oil, and coconut oil) and refined sugars (though many of the paleo cookie recipes break this), dairy (other than a few eggs), and flour or other domesticated and refined grains and legumes. For a longer description of what people generally consider "paleo," you can refer to the post in which I compared 5 paleo brownie recipes. Before recipe-smithing on the fly, I wanted to get a sense of the existing recipe landscape. 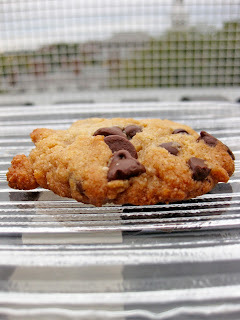 I searched for what looked like to the top paleo chocolate chip cookie recipes on the internet and tested them. 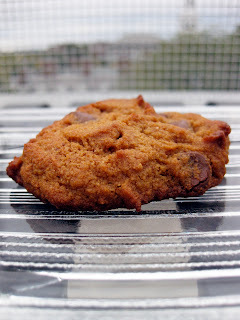 The results are below, along with a photo and link corresponding to each paleo cookie recipe I reviewed. I've included notes on flavor and appearance based on my own observations and the help of three tasters. In the coming weeks, I'll develop my own (hopefully) better recipe taking the best of what I've learned from these and traditional chocolate chip cookie recipes. Again, my goal for this future cookie is to get as close as possible to the traditional chocolate chip cookie in appearance and taste. Keep your eyes peeled for that upcoming post! NOTE: Done and done. . . 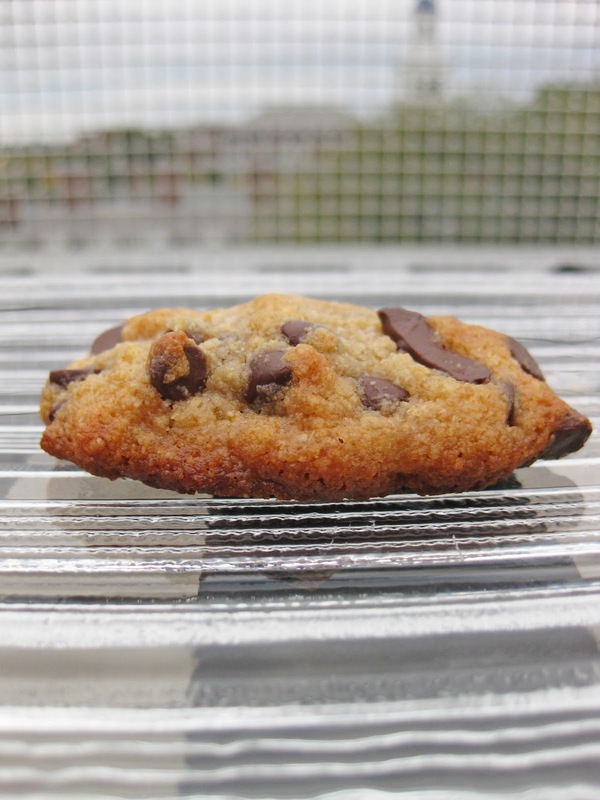 I crafted my own delicious paleo chocolate chip cookie recipe based on what I learned from the six paleo cookie recipes below and trial-and-error recipe tweaking. Finally, though some of the cookie recipes below may not be up to modern gustatory standards, any cave man would prefer them to rotting meat! Flavor: After hearing me list the ingredients and then taking a bite, one taster commented with surprise: "I don't dislike it!" 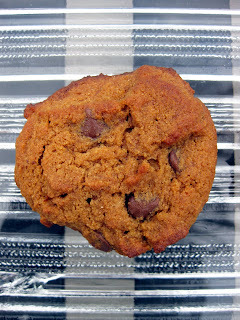 Not too sweet, but not bland, the other tasters described it as a "less sweet chocolate chip cookie." All of us thought it was sweet enough to be palatable, without being as sweet as a standard cookie. I balked, though, at the recipe's lack of salt. 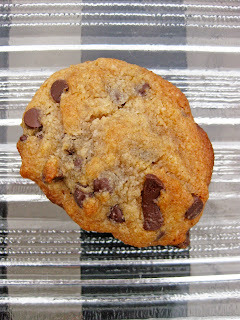 According to my taste, a hint of salt is one of the key characteristics of a classic chocolate chip cookie. 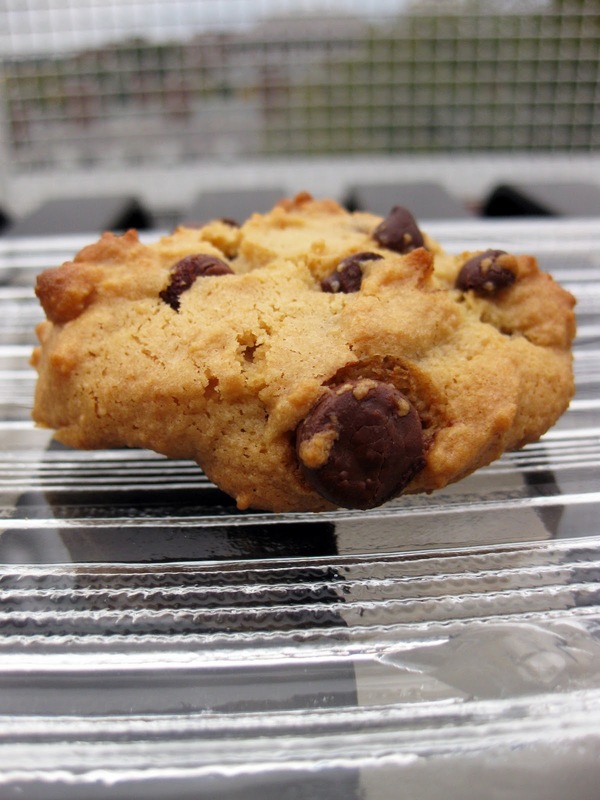 Texture: These cookies are surprisingly lightweight - maybe half the weight of a similar sized standard chocolate chip cookie - and not very durable. My tasters described the texture as "okay," "muffiny," and "grainy." One taster likened it to a "cupcake cookie" similar to the cookies that can be made using funfetti cake mix. I thought the inside of the cookie had a kind of pasty, wet texture (maybe from coconut milk?) that I didn't care for. Appearance: They look rugged, like they're made out of processed granola. The first few batches held their shape like biscuits, so I flattened the last batch before baking to make them look more normal. You would not mistakenly reach for one thinking it was a normal chocolate chip cookie. Overall: I was skeptical about the lack of sugar (sweetness comes only from dates, chocolate chips, and 1/2 Tbs honey), but this was plenty sweet and pretty good! I didn't care, though, for the light texture. Still, at least one taster preferred this recipe to recipe 5, which yields a cookie that is more standard in taste and texture. Flavor: This tastes more like a standard chocolate chip cookie, and more like a cookie in general, than the results of recipe 1. One taster mentioned that he wouldn't have known it was a "specialty" cookie. While the coconut flavor comes through, the maple flavor is not very noticeable. (Note: One blog reader commented that she did not find the coconut flavor to be overwhelming, even though she hates coconut. She also adds an additional half teaspoon of salt to the recipe, which may impact the overall flavor). 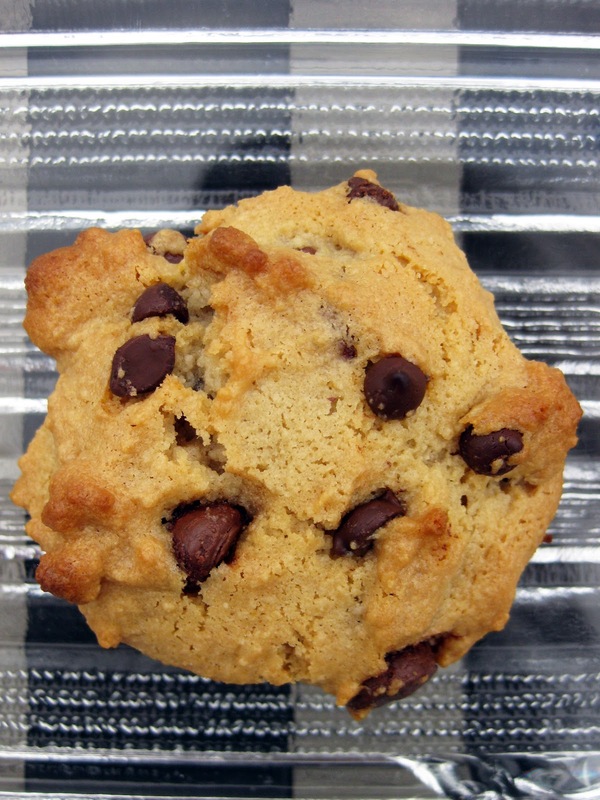 Texture: Cakier than a standard chocolate chip cookie. While the batter seems too wet and oily at first, it dries out while baking. Still, I found the cookie center to have a slightly pasty, wet texture, so perhaps err on the side of baking these longer rather than shorter. 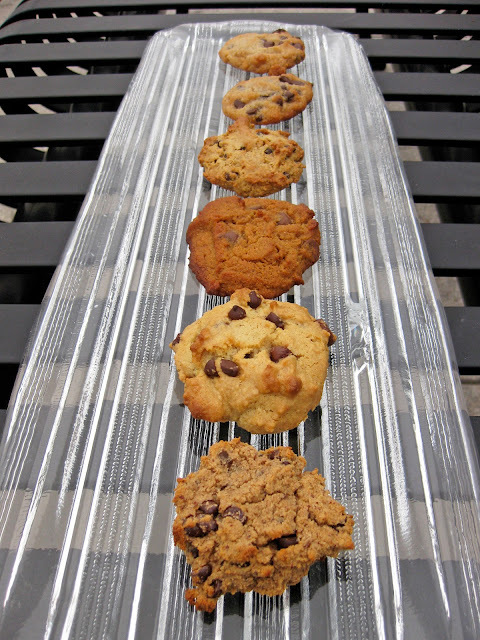 Appearance: These look a lot more like chocolate chip cookies than most of the other recipes, but they need to be pressed flat before baking to achieve the standard cookie look, as they spread very little while baking. A few tasters noted that the exterior is not like a normal chocolate chip cookie...it is shiny/glossy (We're guessing that the maple syrup caused the glossiness). The cookies are also more yellow than standard. Overall: Tasters thought it was good, but didn't rave about it. 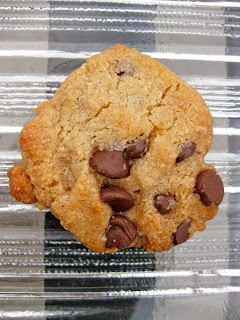 Based on taster comments, this could pass as a regular cookie recipe, but not as a regular chocolate chip cookie. Also, I'm not sure maple syrup fits the bill for most who eat paleo foods, since it's not much different from refined granulated sugar in terms of sugar content. Notes: For almond flour, see notes under recipes 5 and 6 on the best brands to use. I used 1 tsp salt as the recipe called for, but one reader suggests upping this to a total of 1.5 tsp. I baked for 12 min, this made about 36 cookies. Flavor: Taster comments included: "smells and tastes like there are oats in it," "does not taste like a chocolate chip cookie." I thought this tasted pretty good, but was maybe just a little too sweet. Texture: In terms of approximating a cookie, I thought this was the least offensive texture so far. 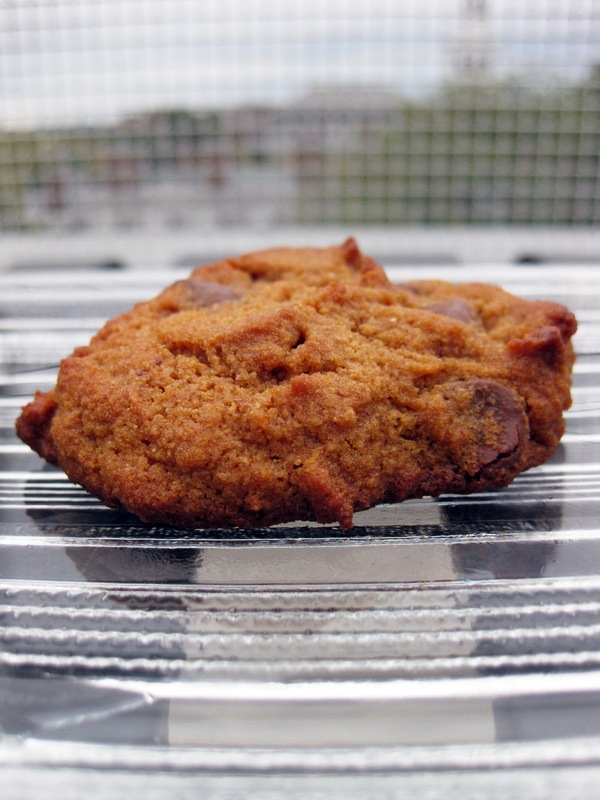 Tasters described the texture as "gingerbready," "loaf-like," and "crunchiness" at the bottom of the cookie. I found the cookies to be soft, again somewhat wet inside but not undercooked, and crispy on the bottom. The batter is denser and dryer than any of the other recipes I tested (though the resulting cookies were not dry) and looks much more like traditional cookie dough. 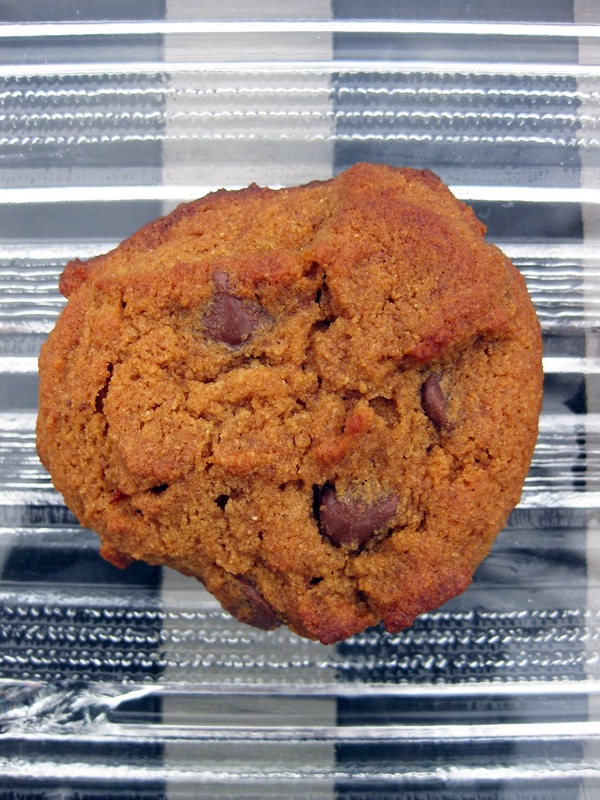 Appearance: Because of the palm sugar, these are much darker than normal chocolate chip cookies: "looks like pumpkin bread"was one taster's assessment. I had to press these cookies flat before baking to help them be cookie-shaped. Overall: This could also probably pass as a real cookie - but not a standard chocolate chip cookie. Also, I haven't looked into the use of palm sugar in the paleo diet. According to the manufacturer packaging, palm sugar ranks lower on the glycemic index than regular sugar. I plan to do a little more reading about sugars and oils before working on my final recipe. Notes: The recipe calls for 1/2 cup + 1 tablespoon coconut flour. Just use 1/2 cup...way easier and no big difference. I added 1/2 tsp salt, since the recipe mentions adding salt in the instructions, but not in the ingredient list. The recipe also calls for 8 tablespoons refined coconut oil. That is equivalent to 1/2 cup, incase you don't want to measure each tablespoon out individually! For me, these took only 8-10 min to bake, not the 13 min called for. Watch closely! The recipe made ~24 cookies. Texture: The texture is also very much like bread: both cake-y and springy. Notes: The recipe calls for splenda/honey/sugar. I tried using Splenda/fake sugar once in a baked good, and it was AWFUL, just AWFUL, bitter and nasty. So, I used palm sugar that was left over from the previous recipe, hoping to maintain moisture ratios called for in this recipe. For me, this recipe made about 12-16 cookies. Note: I changed this recipe quite a bit from the Elana's Pantry version. Skip ahead to Recipe 6 for a better attempt at the recipe. Flavor: All tasters, myself included, were put off by the taste imparted by the oil that I used (walnut). 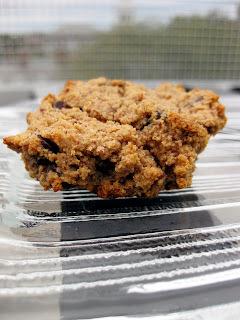 While the original recipe called for grapeseed oil, most paleo experts are rabidly opposed to using grapeseed oil, so I was trying to use a paleo-friendly oil that wouldn't impart cookie-unfriendly flavors. Walnut oil might actually work fine...I think I just need to use less of it. Otherwise, there were no negative comments on the taste. Texture: "Soft," "limp," and "oily" were comments from tasters. Appearance: This and recipe 6 looked the most like real chocolate chip cookies, but there was so much oil in this (my fault) that the cookies looked wet and translucent. Gross! Note: I changed this recipe from the Elana's Pantry version by using a different fat, which may have resulted in a less tasty cookie than if you follow it to the word. Instead of butter, I used walnut oil (1/2 cup plus 2 Tbs), a more paleo-friendly oil, as I had hoped it wouldn't impart strong flavors like olive oil and coconut oil do. This made about 36 cookies. Note: I followed this recipe closely, only exchanging grapeseed oil for a nut oil. Flavor: Salt was doubled in this recipe compared to Recipe 5, and most tasters thought it was an improvement. One taster thought these were a great variant on a traditional soft chocolate chip cookie. However, some tasters thought that the walnut oil imparted a flavor that just didn't work. I would suggest a different type of oil, or less oil. While the original recipe called for grapeseed oil, most paleo experts are rabidly opposed to using grapeseed oil, so I was trying to use a paleo-friendly oil that wouldn't impart cookie-unfriendly flavors. Otherwise, there were no negative comments on the taste. Texture: Like a soft chocolate chip cookie, but a bit oily. Tasters used adjectives like "soft," "limp," and "oily" to describe these cookies. Most objected to the oiliness, but one taster thought they were a great soft cookie. 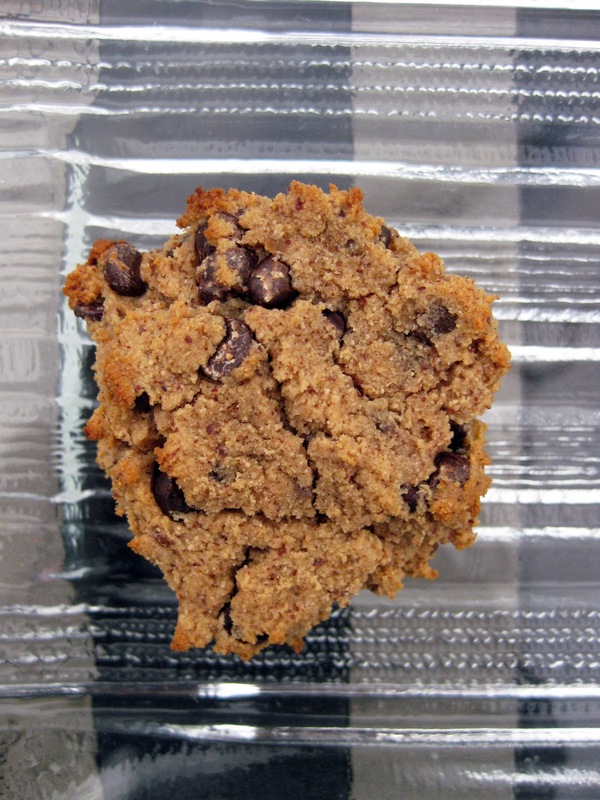 Appearance: For one taster, this cookie conjured up memories of Mrs. Field's cookies in terms of look. 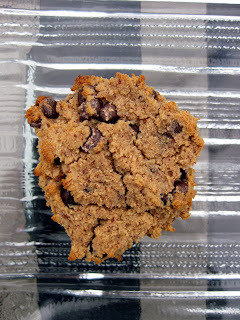 Of all the cookie recipes tested, this one looked the most like a standard chocolate chip cookie. I pressed down on the top of these cookies before baking to help them flatten. Overall: These were the most like regular chocolate chip cookies in terms of appearance and taste, but all six tasters objected to the amount of oil. I thought the oiliness might be due to an inaccuracy in measuring (The first time around, I measured by volume using a measuring cup, which can make it easy to over- or under-measure). However, I made the recipe again and weighed the almond flour with a digital scale. The result was improved, but still too oily. Aside from oiliness, this would be one of the more promising recipes. The recipe calls for grapeseed oil. I used walnut, a more paleo-friendly oil, as I had hoped it wouldn't impart strong flavors like other paleo friendly oils (olive oil and coconut oil) do. This recipe made ~36 cookies. Recipe 7: My own recipe using what I learned from the above recipes! 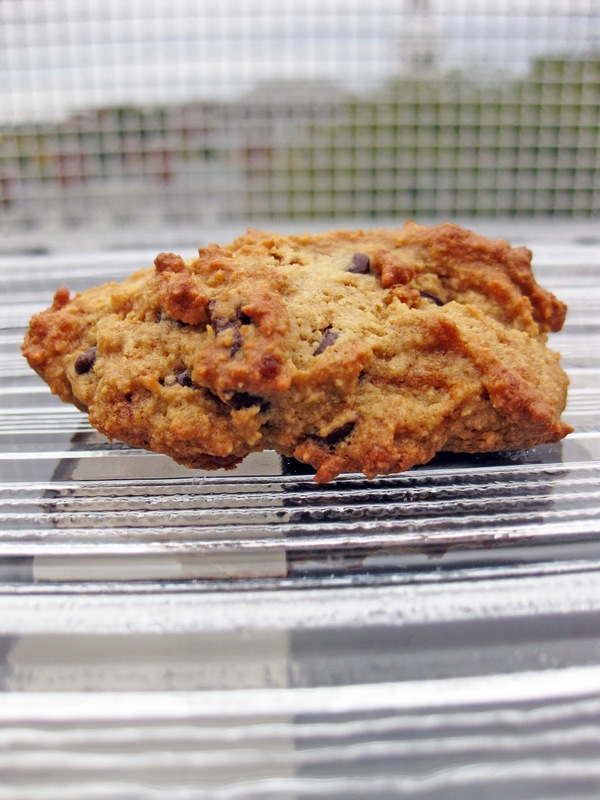 I used what I learned about the ingredients and outcomes of these recipes to make a final paleo chocolate chip cookie recipe that best approximates the standard chocolate chip cookie we all know and love! I hope some of you find these reviews of paleo cookie recipes helpful in your own search for the best paleo chocolate chip cookie recipe. I had a Paleo chocolate chip cookie in a coffee shop in Santa Cruz and I've been craving it ever since. Thanks for your taste test! I'll be looking out for your recipe! I have to disagree with your taste testers about the Food lover's primal palate cookies. This is my go-to recipe for chocolate chip cookies, and I think they're FANTASTIC. I add a half teaspoon of salt to them, cause I like my cookies with more salt. As someone who HATES coconut, I don't taste it at all in my baked cookies! Maybe that added teaspoon of salt balances it out. Most everyone I know who eats my cookies say that they never would have known, save for the odd look of them, that they didn't have flour. LOVE that recipe. Thanks, Gina! I'll edit the post to add your note about the salt! Thanks so much for all your work testing these! This saves me a bunch of time! 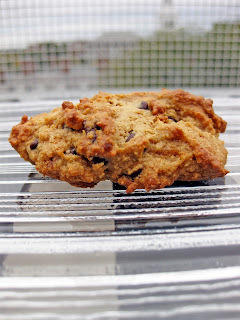 I've tried the coconut chocolate chip cookies from Food Lover's Primal Palate and I like them, but they're not like a normal chocolate chip cookie. 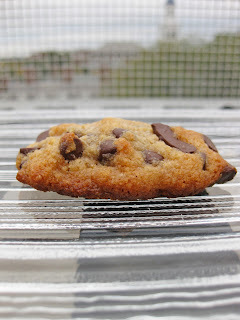 I've also tried the Wanna Be Chef almond flour chocolate chip cookies and I love them, but they're not paleo. Yours are in the oven right now. I can't wait to try them! LOVE THIS! Thank you for posting this! I made #6 last night and my husband loved them!!! I added shredded almonds on top and they were amazing!! 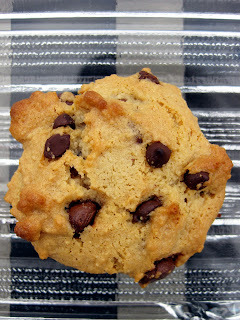 The grain free chocolate chip cookies from paleoplan.com are delicious and back up great. I am trying to think about what Melanie said on modifying and adding stevia. Agave Nectar, unfortunately, is considered a high fructose syrup like maple syrup. I understand the natural component of it, but as I study the paleo lifestyle more and have read many articles on agave nectar, my personally feeling is, its more towards something we should not eat vs something we should. The flip side, its a healthier option than sugar. Stevia is one that is still in the air for me and a lot of people, so far things are safe with it, so stevia instead of agave nectar might be the better choice. I prefer honey since it is more natural and our bodies do recognize it as a natural sweetener. I am wondering if it is a 1:1 ratio vs agave nectar. Any ideas on which it might be? Thanks for your thoughtful comment! If you'd like to use honey in place of agave nectar, I would suggest a 1:1 ratio. I have used it in this substitution ratio in the past for cookies, and it has worked. However, for less refined honey, the characteristics of the product vary a lot across brands in terms of quantity of comb/wax, moisture, sweetness. Still, my hunch is that 1:1 is a good starting place for your substitution! One thing I have noticed, though I don't know if it will be helpful for you or not, is that cookies I've made with agave syrup spread just a little more than when I made the same recipe with a raw, natural honey with high wax content from the honeycomb. What do you think the effect would be of subbing peanut butter for the oil? Could 1/2 cup peanut butter be substituted, or should the ratio change? I'm not sure on this one...but I would imagine that a 1:1 peanut butter to oil substitution would leave your baked good dry and chalky; it likely wouldn't contain enough oil for a 1:1 substitution. I'm not sure, though what the effect would be of increasing the peanut butter content. Don't be afraid to try it, though. Best of luck! My wife and I made recipe #2 but used the unrecommended almond flour (it was all we had access to) and substituted butter for the coconut oil based on one of the notes on that blog. They were delicious! I am going to order some of the other almond flour you recommend so I can see how different it is with finer ground almond. But I love them already. These were my treat after completing round one of the 21 Day Sugar Detox (by Diane Sanfilippo). 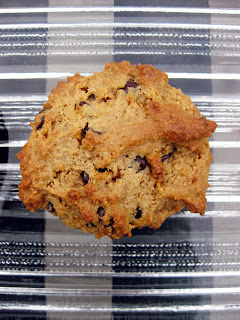 What do you think of substituting roasted cocoa nibs for the chocolate chips? I know they aren't sweet but taste wise I think they'd have an awesome chocolate kick. Hmm! Fun idea ... I like it! It might turn out really good. And if the extra sweetness is missed, it would always be possible to add a little more sweetener to the batter. Not to be a negative nelly- but it is not ok to copy and past all of these various recipes from other people's blogs and books!! This sort of thing really upsets most bloggers.. I know I would be mortified if I discovered one of my recipes copied in this manner. Your best bet is to provide links to each recipe instead with your review of each! I'm good friends with Elana and she would be bummed to see this. Hi Brittany, I do credit the original authors and link back to the recipes. I do see your point, though, and will go ahead and do that! Done! Now none of the recipe lists are recreated here - only the original link-backs remain, along with my notes on the recipes and the changes I made to them. For the record, I don't ever copy down recipes from books, though I do let readers know whether they turned out, and I encourage them to buy the book to get the recipe. Thanks for your concern! Peanut butter isn't Paleo. Almond butter or cashew butter is. Apple sauce can be used to substitute oil. Did you use honey in your version of #6? I saw someone mention it in a comment that would have been there before you removed your versions of these cookies, but I don't see that in your notes. Hoping to try them soon, but wanted to make sure to be using the correct sweetener. In that recipe, I basically took recipe 6 and cut the oil in half. And I tried it both ways --- with agave and then with honey -- and I detail how it turns out differently based on what you choose. In that case, with raw honey the cookies don't spread as much (I think because there's naturally some wax in raw honey), so you have to press them down more.